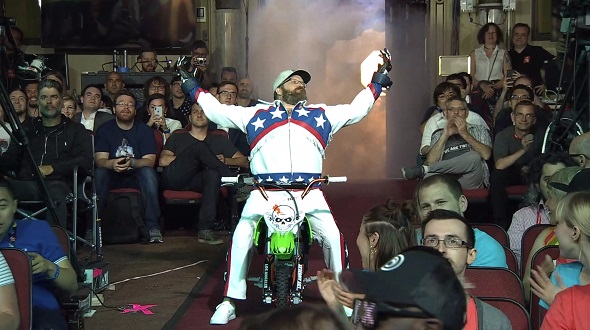 “Trials is all about crashing with style, and getting up again,” Antti Il Vessuo, the creative director of comedic motorbike crashing simulator Trials, says after crashing into a podium at the Ubisoft E3 conference while dressed in a Evel Knievel gear. Fair enough. Anyway, he announced Trials Rising. The new trailer, which you can watch below, basically confirms that it’s more Trials, which is by no means a bad thing. Co-developed by Ubisoft studios in RedLynx and Kiev, Rising will have you undergoing trials on tracks based on real locations from around the world. Naturally, the big focus is on earning top leaderboard spots, but you’ll also be able to compete directly against other players, and take on challenges from in-game sponsors to rise through the ranks. You’ll be able to customize the looks of your riders and bikes, which you can then share online, earning rewards as other players make use of your designs. A new mode called Tandem Bike will have you split control of a motorcycle with another player, offering a doubly challenging way to take on new tracks. You’ll also have local and online multiplayer options, as well as the opportunity to race against other players’ ghosts.